Yosemite National Park covers a huge area of the western Sierra Nevada mountains in central California and has innumerable lakes, meadows, forests and granite summits with endless unspoilt Alpine scenery. At the center is Yosemite Valley, a half-mile deep depression carved by glaciers during the last ice age, which now has soaring 3,000 foot high domes and many powerful waterfalls, including three of the world's highest. The area received national park status in 1880, as a result of the efforts of the pioneering Scottish naturalist John Muir, and has grown in popularity ever since. The Merced River runs through Yosemite Valley, and is followed either side by two scenic drives, allowing easy access to many viewpoints, picnic areas and trails. 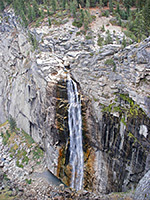 Elsewhere in Yosemite National Park are vast areas of unspoilt and sometimes inaccessible scenic wilderness, as is the case with Kings Canyon and Sequoia, the other national parks in the Sierras. 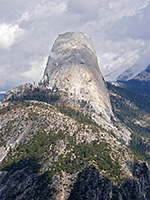 One of two main routes into the backcountry is the road to Glacier Point, a 16 mile drive leading to several excellent overlooks of the main valley, and many footpaths. 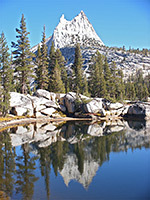 The other is the Tioga Road (CA 120), along which is a second park visitor center at Tuolumne Meadows - a beautiful region with many small lakes, stark granite peaks, clear mountain streams, waterfalls and meadows with colorful summer wildflowers. An extensive network of trails allow for relatively easy exploration of this splendid landscape. 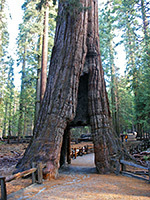 There are three groves of giant sequoia trees in Yosemite National Park, two near Crane Flat (the Merced and Tuolumne groves) but the most famous is the Mariposa Grove of Big Trees in the southwest corner, near the private village of Wawona. More than 400 huge sequoias grow over the sheltered hillsides; the largest is the Grizzly Giant, estimated to be nearly 3,000 years old. The remote northern half of the park is served only by the Hetch Hetchy road, leading to the Hetch Hetchy Reservoir. This was formed in 1923 by construction of a dam to provide drinking water for the people of San Francisco. The dam caused flooding of the lower reaches of the Grand Canyon of the Tuolumne River - said by John Muir and many others to be as magnificent as Yosemite Valley. Yosemite National Park is 200 miles east of San Francisco; three state roads (CA 120, CA 140 and CA 41) approach from the west and converge on the lower end of the valley. 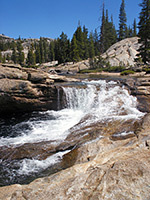 CA 120 continues east across the Sierras via the Tioga Pass, a route that is often blocked by snow until June. No roads cross the mountains south of here for 140 miles. At the western end of the valley where the mountains at either side come close together, the roads become narrow, cut precariously into the cliffsides, and pass through several tunnels - these open to reveal an astonishing vista of vertical cliffs and green woodland, fading into the hazy distance; this is Yosemite Valley, central attraction of the park. Outside the national park there are various towns providing lodging and other visitor facilities. One of the closest hotels is Best Western Yosemite Gateway Inn, in the middle of the small but busy town of Oakhurst (15 miles south of the Wawona entrance); this well reviewed hotel has a pleasant setting amidst pine and oak woodland, along CA 41 half a mile north of the junction with CA 49. The 122 rooms are divided into several blocks surrounded by gardens (with waterfall) and trees, close to various shops and restaurants along the main road through Oakhurst. Nearby towns with hotels, with distances from the park boundary, include Oakhurst (15 miles), Mariposa (38 miles) & Merced (63 miles), and in the east, Mammoth Lakes (36 miles). Follow the links for hotel descriptions and photographs. 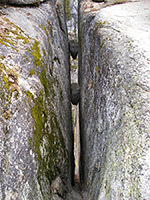 As Yosemite is the preferred destination of three million visitors each year, many of whom do little more than drive around the roads of the main valley and stop to take photographs, this area has become quite congested, and some parts have become spoilt by badly-planned developments, overcrowding & commercialism. In January 1997 severe flooding destroyed half the campsites and one third of the buildings, so it was decided that many would not be rebuilt, and instead the land would be returned to nature. Other improvement measures include a reduction in the number of roads available to private cars and increased use of shuttle buses, as is the case, for example, with Zion Canyon in Utah and the Grand Canyon in Arizona. Still, even in the heart of Yosemite Valley, perfect solitude is only a 30 minute walk away along one of the many trails leading into the wilderness, and despite the overcrowding, the scenic drive along the Merced River is a must for any visitor to California.